Editor’s Note: Use the table below to find the correct Flowmaster Super 44 configuration for your car or truck. Not sure which to choose? Follow links to check vehicle fit on Amazon. 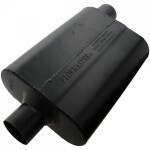 Read my Flowmaster Super 44 muffler reviews before you start shopping for a new exhaust system online. In my search for a muffler with the best sound, I constantly heard great things about the Super 44. Why is this muffler a great choice? It uses the same Delta Flow technology found in the larger Super 40 mufflers. Plus, they have a powerful rich tone and an aggressive, deep sound. 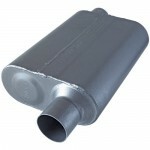 The muffler is constructed with 16 gauge aluminized steel and fully MIG welded for maximum durability. If appearance is important to you, it comes in both black aluminized steel and stainless steel. 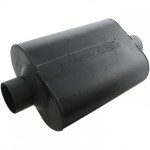 Whenever upgrading your muffler, size is one of the most important factors. The Super 44 can be easily used for street applications due to its compact configuration. When ground clearance is important, the slender design will give you the extra room you need. The muffler case is 13 inches long and is only 4 inches thick. The overall length is 19 inches and is 9.75 inches wide. Flowmaster describes the Super 44 sound as a powerful, rich tone. 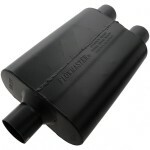 Not to mention it is the most aggressive, deepest sounding street muffler Flowmaster has ever built. After installing these mufflers some of our readers reported noticeable sound differences. For example, one reader described the new sound as having a throatier rumble when idling. 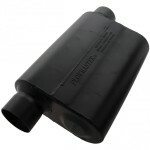 The best part is that this muffler produces very little internal resonance sound which will not drown out your stereo. 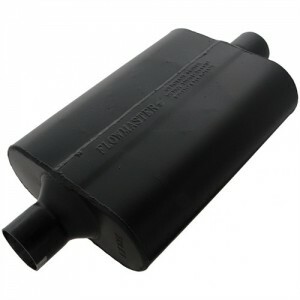 All of the Flowmaster Super 44 reviews I’ve read are very positive. Most customer mention that they are impressed with the great sound they get from this simple upgrade. If you’re like me, you have to make your cash go further when you buy performance parts. One reason why I like this performance muffler over others is the low cost. Not only will you get great sound at that price but you may also see noticeable performance gains. What Vehicles Does the Super 44 Fit On? 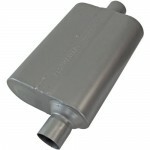 Not sure if the Super 44 Muffler will fit your vehicle? No worries, the muffler is available in 7 different configurations. Whether you need a center, dual or offset configuration, there is an option that should fit your car or truck.